Located in the north-eastern state of India- Arunachal Pradesh, the Namdapha National Park is the largest protected area in India and is the perfect Eastern Himalaya biodiversity hotspot. Recognized as one of the richest areas in biodiversity in India, the park harbors the northernmost lowland evergreen rainforests in the world at 27°N latitude. The area is also known for extensive Dipterocarp forests among the last great remote wilderness areas of Asia. Namdapha and its adjoining areas, is flanked by the Patkai hills to the south and south-east and by the Himalaya in the north and lies close to the Indo-Myanmar-China tri-junction. The reserve area of Namdapha first came into existence and notice to the international importance during the Second World War due to its rich biodiversity. The latter half of the war was witnessed here with several pilots being crushing at this site as a result of multiple air turbulence over the area. 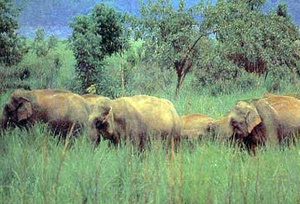 The Assam Rifle conducted its forts scouting in the Vijaynagar area and then in the year 1972, Namdapha was established as a wildlife sanctuary. And the renovation work was still carried on to make the routes in a motorable condition. 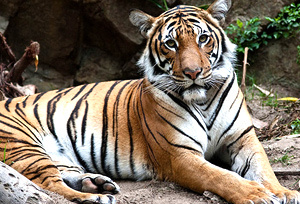 Further, in 1983, the park was declared a Tiger Reserve and National Park. The area of Namdapha also proved to be the refugee camps for many immigrants and till today The Chakma, refugees from Bangladesh, are the recent immigrants to the area, being settled by the Indian government in the 1960s in the areas between the town of Miao and the western edge of Namdapha. Interestingly today, the Namdapha Reserve is among one of the prime attractions topping the list, while touring Itanagar. Due to the presence of different vegetation, this park is known to be the ultimate zone for many of the rare species of animals such as snow leopards, clouded leopards, common leopards, tigers and even Red Pandas. One can also get to watch the Himalayan bears. Other large predators are dholes, wolves, and Asiatic black bears. Smaller carnivores can be traced are red fox, red panda, Eurasian otter, yellow-throated marten, spotted linsang, binturong, Oriental small-clawed otter, common palm civet, small Indian civet, large Indian civet, masked palm civet, marbled cat, fishing cat, Asiatic golden cat and some species of mongoose. Grandly, the large herbivores are represented by elephant wild boar, Indian muntjac, forest musk deer, sambar, gaur, hog deer, mainland serow, common goral, takin and bharal. Seven species of non-human primates including Stump-tailed macaque and Slow Loris, Hoolock Gibbons, Capped Langurs, Assamese Macaques and Rhesus Macaques. These animals are usually rare to sight in common places and the tourists need to make great efforts out of a successful safari excursion. Undoubtedly, visiting Namdhapa National Park and watching them from one's own eyes make the unique thrilling experience in itself. The park also has about 425 species of avi-faunas with many more to be recorded from work in the higher areas. There are five species of Hornbills recorded from the area. Several species of rare wren-babblers have been recorded in Namdapha. Other bird groups comprise laughing thrushes, parrotbills, shrike babblers, fulvettas and scimitar babblers. 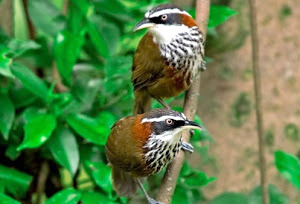 The Snowy-throated Babbler is a rare species of Babbler found only in the Patkai and Mishmi hills and nearby areas in Northern Myanmar, is found in Namdapha. Other rare, restricted range or globally endangered species include the Rufous-necked Hornbill, Green Cochoa, Purple Cochoa, Beautiful Nuthatch, Ward's Trogon, Ruddy Kingfisher, Blue-eared Kingfisher, Whitetailed fish eagle, Eurasian Hobby, Pied Falconet, White-winged Wood Duck, Himalayan Wood-owl, Rufous-throated Hill-partridge, and White-cheeked hill partridge. Many plants found in Namdapha are rare, endangered or endemic species. Sapria himalayana and Balanophora spp. are rare root parasites of lianas and other plants. Of the twenty taxa of gymnosperms occurring in the North-East (out of a total of 54 for India), several are found in Namdapha, species of Amentotaxus, Cephalotaxus and Larix being endemic to this region. Some species, such as Pinus merkusii (Sumatran pine) and Abies delavayi (Delavay's Fir) are found nowhere else in India. A variety of ferns are also found and among the most prominent is the primitive tree fern Cyathea sp. Several rare orchid species including Paphiopedilum fairrieanum (Host's slipper Orchid) and Vanda caerulea (Blue Vanda) may found in Namdapha. Miao Museum - Maintained by the Namdapha park authorities, Miao Museum is located near to the Field Director's Office. One of its rooms is selected for keeping the animal specimens collected from Namdapha and surrounding areas over the course of several surveys and decades. There are many snake and frog specimens as well as a large number of bird skins, mammal pelts and skulls. For greater interests, there is a complete skeleton of a large python mounted on the wall. A second room displays the clothing, tools and village life of the local people. The museum is open on all the working days. Miao Mini Zoo (Miao) – The Miao zoo is situated opposite to the museum near the Field Director's Office. Several primates found in Namdapha are housed in the zoo, including hoolock gibbons, pig-tailed macaque, Assamese macaques, stump-tailed macaque and slow loris. Small carnivores will include Himalayan palm civet and other small mammals like porcupines and leopard cats. Among the other attractions are black bears and an enclosure with a gharial. Outside the zoo is a large enclosure with sambar and barking deer. Moti Jheel (@buffer zone) – by making a 10 mile walk of two to four hour from the forest department campsite, the tourists can find Moti Jheel. It is a small natural pool (or jheel­) situated atop a plateau called Gibbon's Land. The path to Moti Jheel is steep, but runs through beautiful deciduous and semi-evergreen forests, with moss-laden branches and trees covered in epiphytes. The path is a superb bird watching trail, where one can find specialties like the Green Cochoa and Rufous-throated Fulvetta. Gibbons, capped langur, Malayan giant squirrels and smaller squirrels can usually be sighted. During the rains, it is not uncommon to come across a mountain lizard (Japalura) or keeled box turtle. Although the pool is small and often overgrown with vegetation; but could be a good option for some kind of leisure walk. Raja Jheel (@buffer zone) - Raja Jheel can be reached by a path bifurcating from the main path between Hornbill and Firmbase just before Rani Jheel. The jheel is about an hour's walk from Rani Jheel. Raja Jheel is a forest swamp that is now completely overgrown with vegetation, but the main attraction is the habitats and bird life en route to the swamp. The path to Raja Jheel continues to the mountains beyond the swamp, and can be resulted in a steep and difficult route on further trailing. The tourists can avail the camping experience on the way to Raja Jheel at a small stream in a valley, which is about a twenty-minute walk from Rani Jheel. Gandhigram : Gandhigram is the largest settlement near Namdapha which is locally called Shidi (flat land) by the Lisus. Gandhigram is a tidy and well-planned village, with the traditional chang-houses built in rows along several parallel streets. This could be a great opportunity for the traditional and local entropy at the reserve area. Vijaynagar : about 18 km from Gandhigram, Vijaynagar is the base area where the Assam Rifles is stationed and Indian Air Force also maintains an advanced landing ground or ALG. For the general information, Jeeps will not be available for Jeep Safari in Namdapha since the area of Namdapha is best recognized as a birding paradise with more than 400 species represented with some rare species found here only; so the reserve management tend to avoid the disturbances caused by motor vehicles. Permits – There are two permits essential to visit Namdapha Natioanl Park: one is the Inner Line Permit for entry into the state of Arunachal Pradesh, and the other is a tourist permit issued by the office of the Field Director, Namdapha National Park to enter Namdapha. The months of November to February are cold bringing relatively drier season. March and April seasons are best to witness sporadic showers. May is hot and largely rainless. The wet season is from June to October. Namdapha receives rains twice in a year. During southwest monsoon (June to October), rivers and perennial streams are in a wage to become almost impassable for the locals and the tourists. Rains also cause landslides which increases the risk. October to March is the best time for visiting the park. By Air : About 160 km away from the reserve, Mohanbari in Dibrugarh is the nearest airport. Guwahati airport at 600 km is better connected further from Dibrugarh. Dibrugarh to Miao takes about six hours drive. Buses from Guwahati are the most convenient option. By Rail : Tinsukia in Assam is the nearest railhead. By Road : The route from Dibrugarh to Miao goes via Tinsukia, Digboi, Margherita, Ledo, Jagun, Namchik and Kharsang. The drive takes about six hours to reach the place. Several private bus companies manage the 'night super' overnight buses from Guwahati. The buses leave in the afternoon to reach Jagun early next morning. Jagun is about a two-hour drive from Miao. Arunachal Pradesh State Transport Service (APSTS) runs four buses to and from Miao. Taxis can be hired from Dibrugarh, Tinsukia and Digboi for Miao. For best accommodative services, the government-run circuit houses and bungalows in Namdapha is the coolest option. Camping in tents at the designated campsites is also a good idea. Forest rest house, tourist lodge, tourist huts and dormitory are available for stay in Deban (26 km from Miao). Camping is usually organised and supervised by tour operators. Besides, for luxury retreats, many hotels and resorts are available at the reserve area for much specific amenities and services.